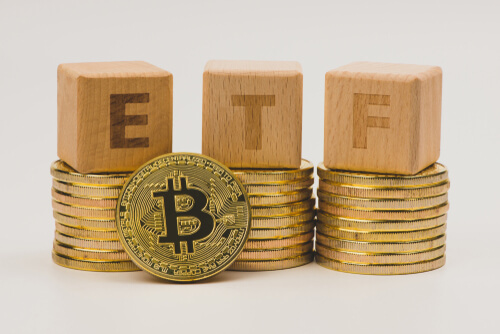 Setting the stage for a bitcoin exchange traded fund (ETF) has been quite a long-drawn prospect, but one finance manager is confident that it will happen soon. The hype surrounding the much-anticipated bitcoin ETF has been high during the past weeks with traders bracing for its impact. For instance, CBOE – one of the largest exchange holding companies in the world – backed out of its ETF proposal because of government shutdown. Then a few days after that, it filed for reapplication with the SEC, with most crypto players not even taking notice. Regulating the digital currency market has been one of the biggest challenges that the SEC had to deal with in the past years. For one, crypto trading does not have a stable chain of security measures compared to other financial markets. And secondly, the regulatory body is not well-equipped in terms of exercising full control over price exploitation considering its limitations in controlling overseas trading systems. Now, with proposals being subject to a 240-day deadline; and considering SEC’s propensity to capitalize on this deadline, many people in the bitcoin community think that an ETF will not materialize until the later part of the year. 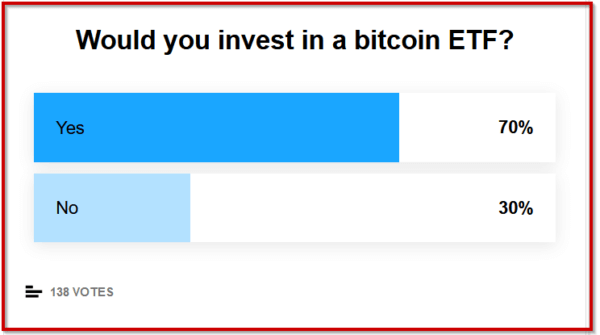 Meanwhile, a recent survey conducted by CNBC, as shown above, bared that 70 percent of respondents said they are willing to invest in a bitcoin ETF. The post Survey: 70 Pct Willing to Invest in Bitcoin ETF as Experts Believe it’s “Virtually Certain” appeared first on Live Bitcoin News.